Good enough for an American president! Broccoli is a much-maligned vegetable, which is a pity because if it is grown well and cooked as soon as it has been picked, it is not only very nutritious, but delicious, too. It's important not to overcook it, though. Soggy broccoli is absolutely dire. 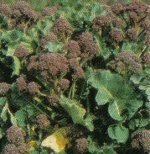 This page covers white and purple sprouting varieties of broccoli. Heading broccoli is dealt with on the page on cauliflower, and green sprouting broccoli on the page on calabrese. Choose an open, unshaded site with fertile, well-drained and moisture retentive soil, which should be slightly acid (min pH 5.4, but see note on clubroot - add lime if necessary to adjust pH). Brassicas have a high nitrogen requirement and also need very firm soil. To ensure sufficient nutrient levels, it is best to topdress or apply a liquid feed such as seaweed fertiliser during growth. Transplant 60cm each way (2'x2'). Stake firmly in autumn, earth up as plants grow. Protect from pigeons in winter. Harvest the central spear first, followed by the side shoots. Picking starts when spears are the size of large walnuts. Regular cropping increases yield.